Tom and Amy run an orphanage in Zambia, Terra Nova Children's Home by showing the love of Jesus Christ to the local community who are unable to care for their little ones or who have become orphans through the death of mothers infected with HIV or who die in childbirth. Tom also works hard in training local pastors. There has been a recent fire, which completely destroyed a food and equipment storage area; the great radiated heat generated also destroyed most of the adjacent kitchen area. All stored and immediate food was destroyed, as well as most of the cooking and serving utensils, as well as many other items. Now there are great challenges facing Tom, Amy, the staff and volunteers, and of course these precious children, with the need for frequent travel to continue to provide food and good nutrition with little storage capacity. This is a daily task, in addition to having to clean up, rebuild and restore the damage to the facility. 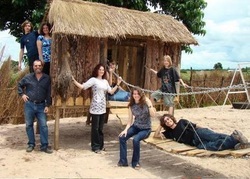 Thank you for remembering this wonderful ministry in your daily prayers; please continue pray for God's Grace, mercy and strength to Tom, Amy, the staff and volunteers, and the children in coming weeks as they face these many challenges, and please consider their great financial needs during this time. Emmanuel Roshan ministers to the Pakistani people in a largely Muslim nation, where there is hostility toward - even active persecution of - Christians. 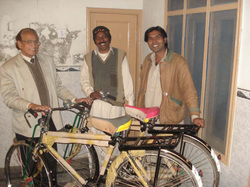 Pastor Roshan trains men who go out into the villages on bicycle, sharing the Gospel and ministering to the people. The ministry further trains local pastors in God's Word, gives them encouragement, and purchases and delivers supplies out to the impoverished countryside. 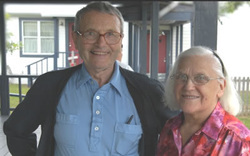 George and Erica, now retired from their previous work in ministry of God's Word in Germany and Africa, have entered a new phase of their ministry, now faithfully bringing God's Gospel and Word to those in a local retirement community in Houston. Operation Grace World Missions supports Christian ministries, proclaiming the Gospel of our Lord Jesus Christ throughout the world. Though each ministry is completely independent, they share common values and the goal of accurately presenting the message that God offers eternal salvation to everyone through faith alone in Christ alone. Most of these ministries seek to establish local churches with indigenous Pastor-Teachers. 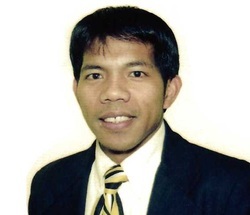 Pastor Moises has trained in the United States and now works to bring the Gospel of Christ and the Word of God to the people in the Phillippines. He recently established a small local church that has now grown to about 50 members. Autumn Rain International (Bibles for Asia) ministries deliver thousands of Bibles (in local native languages) to tens of thousands of impoverished and often persecuted people deep within Communist countries such as China and Viet Nam, as well as many other remote places that are extremely hostile to Christianity. The governments in these areas are very suspicious and hostile toward the delivery of the Bibles, yet many people involved in this ministry continue the deliveries, often at significant risk to their own physical lives, persevering in this important mission.